Posted: Monday 27th April 2015 in Paid Media, Thought Leadership. London celebrated its 61st Fashion Week (LFW) last February, a highlight of the international fashion and retail calendar which turned global attention to the UK. No longer known as the ‘little sister’ of the big four fashion capitals, London is firmly on the map. It is now seen as the hottest and most exciting capital, creating and nurturing successful global fashion brands. As Changemakers in Retail, it is critical that we are up to speed on the trends, consumer insights and innovation & technology in the fashion industry. Armed with this knowledge we can speak to our clients on equal terms, with a true understanding of the challenges and opportunities they face. This season we were lucky enough to attend some of the shows, and were certainly not let down by the creativity and pride that shone through from our British designers. 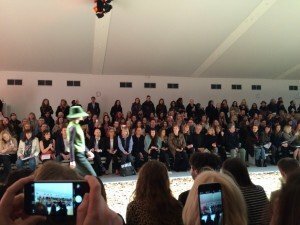 Global names such as Anya Hindmarch, Burberry Prorsum, Hunter Original, Paul Smith, Pringle of Scotland, and Topshop Unique showed alongside future global starlets such as Simone Rocha, Mary Katrantzou, Holly Fulton, Peter Pilotto and Gareth Pugh in a range of venues across the capital. Despite the glitz, the glamour and the all-night parties, a more serious note prevailed, which is the important financial impact that the British fashion industry is having on our UK economy – £26billion to be precise! A figure that most people, I imagine, may be surprised to read. This figure takes into account not only the direct contribution of wholesale, retail and manufacturing, but also the knock-on impact on tourism and the financial services in the country. 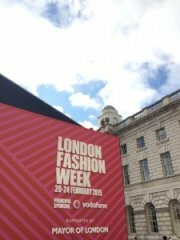 LFW alone generates over £100million worth of orders each season, as well as welcoming guests, journalist and buyers from 61 countries around the world who fly in just for this occasion. The UK fashion industry now employs over 797,000 people in the UK and the figure is likely to rise over the next few years as more positions open up within the industry in various fields. These figures, announced by the British Fashion Council’s Chairman Natalie Massenet on the opening day of Fashion Week, showcase the importance of LFW in generating international attention. For us, one of the key takeaways was hearing that £10.7billion is spent annually on online fashion in the UK, and also that this figure is expected to reach £19billion by 2019. This figure cannot be ignored; it demonstrates that fashion retailers understand the importance of shifting their marketing spend to engage customers online. This will create amazing opportunities for eCommerce development and creative online marketing campaigns. Fashion brands who are not already engaged in online activity must embrace the market and make sure that their eCommerce offerings are up to scratch, so that they reach their full potential and capture a hearty proportion of online spend and customers. If you have any questions or would like to know more about how we can help you make more money online, contact Dave Trolle on (01482) 876876.